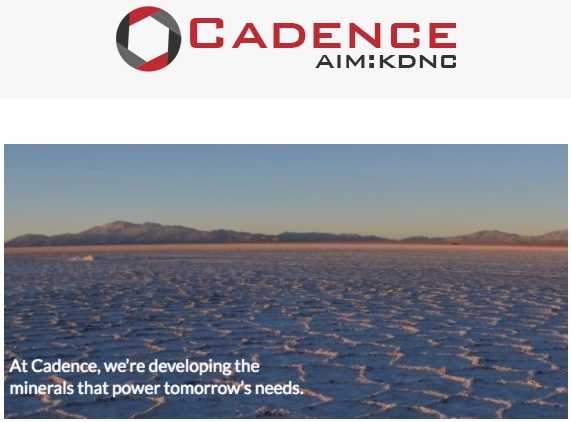 Cadence Minerals (AIM/NEX: KDNC; OTC: KDNCY) is pleased to announce that it has raised £1.3 million through a placing (“Placing”) of 866,666,663 new ordinary shares (“Placing Shares”) in the capital of the Company with new and existing investors. The Placing is being made at an issue price of 0.15 pence per share (“Placing Price”), representing approximately 21% discount to closing price of the Company’s ordinary shares on the business day prior to this announcement. The Company expects to use the proceeds of this fundraise to fulfil the initial exploration expenditure on the Australian lithium assets, as announced on the 4 March 2019, ongoing due diligence and project review across several potential investments and for general working capital. The Company has entered into a placing agreement (“Placing Agreement”) with WH Ireland pursuant to which terms WH Ireland agreed to arrange the Placing. The Company has given certain customary warranties and indemnities under the Placing Agreement in favour of WH Ireland. Completion of the Placing is subject to the satisfaction of the conditions contained in the Placing Agreement including, but not limited to, Admission. Your attention is drawn to the detailed terms and conditions of the Placing set out in the Appendix to this Announcement (which forms part of this Announcement). The Appendix to this Announcement contains the detailed terms and conditions of the Placing and the basis on which investors agreed to participate in the Placing. The Placing has not been underwritten by WH Ireland. Placees are deemed to have read and understood this Announcement in its entirety, including the Appendix, and to have made their offer on the terms and subject to the conditions contained herein and to have given the representations, warranties, undertakings and acknowledgements contained in the Appendix to this Announcement. 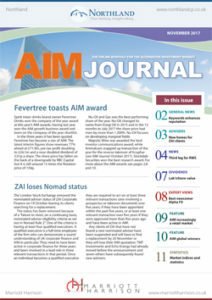 The Placing Shares will be issued, credited as fully paid, and will rank pari passu with the existing Ordinary Shares in issue in the capital of the Company, including the right to receive all dividends and other distributions (if any) declared, made or paid on or in respect of such shares after the date of their issue. Application will be made for the admission to trading on the AIM market (“AIM”) of London Stock Exchange plc (“LSE”) and to the NEX Exchange Growth Market (“NEX”) which is operated by NEX Exchange Limited (“NEXE”) of the Placing Shares (“Admission”). Admission is expected to occur on or around 08 April 2019. Following Admission, the Company will have 8,718,107,002 Ordinary Shares in issue. There are no shares held in treasury. The total voting rights in the Company is therefore 8,718,107,002 and Shareholders may use this figure as the denominator by which they are required to notify their interest in, or change to their interest in, the Company under the Disclosure Guidance and Transparency Rules. 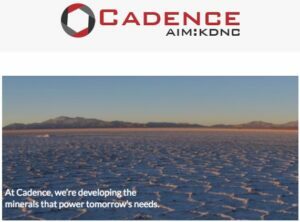 THE PLACING ANNOUNCEMENT (“ANNOUNCEMENT”) OF CADENCE MINERALS PLC (THE “COMPANY” OR “CADENCE”) WHICH ACCOMPANIES THESE TERMS AND CONDITIONS AND THE INFORMATION CONTAINED IN THE ANNOUNCEMENT IS RESTRICTED AND IS NOT FOR PUBLICATION, RELEASE OR DISTRIBUTION, DIRECTLY OR INDIRECTLY, IN WHOLE OR IN PART, IN, INTO OR FROM A PROHIBITED JURISDICTION. TERMS DEFINED IN THE ANNOUNCEMENT SHALL HAVE THE SAME MEANINGS IN THESE TERMS AND CONDITIONS, SAVE AS DEFINED OR PROVIDED FOR OTHERWISE. MEMBERS OF THE PUBLIC ARE NOT ELIGIBLE TO TAKE PART IN THE PLACING. THESE TERMS AND CONDITIONS SET OUT HEREIN ARE FOR INFORMATION PURPOSES ONLY AND ARE DIRECTED ONLY AT: (A) PERSONS IN MEMBER STATES OF THE EUROPEAN ECONOMIC AREA WHO ARE QUALIFIED INVESTORS AS DEFINED IN SECTION 86(7) OF THE FINANCIAL SERVICES AND MARKETS ACT 2000 AS AMENDED, (“QUALIFIED INVESTORS”) BEING PERSONS FALLING WITHIN THE MEANING OF ARTICLE 2(1)(E) OF THE EU PROSPECTUS DIRECTIVE (WHICH MEANS DIRECTIVE 2003/71/EC (AS AMENDED BY DIRECTIVE 2010/73/EC)) AND INCLUDES ANY RELEVANT IMPLEMENTING DIRECTIVE MEASURE IN ANY MEMBER STATE) (THE “PROSPECTUS DIRECTIVE”); AND (B) IN THE UNITED KINGDOM, QUALIFIED INVESTORS WHO ARE PERSONS WHO (I) HAVE PROFESSIONAL EXPERIENCE IN MATTERS RELATING TO INVESTMENTS AND ARE “INVESTMENT PROFESSIONALS” FALLING WITHIN ARTICLE 19(5) OF THE FINANCIAL SERVICES AND MARKETS ACT 2000 (FINANCIAL PROMOTION) ORDER 2005 (THE “ORDER”); (II) ARE PERSONS FALLING WITHIN ARTICLE 49(2)(A) TO (D) (“HIGH NET WORTH COMPANIES, UNINCORPORATED ASSOCIATIONS, ETC”) OF THE ORDER; AND (C) PERSONS OUTSIDE OF THE UNITED KINGDOM TO WHOM IT MAY OTHERWISE BE LAWFULLY COMMUNICATED IN COMPLIANCE WITH ALL APPLICABLE LAWS AND REGULATIONS OF THE STATE IN WHICH THEY ARE A NATIONAL AND/OR RESIDENT (ALL SUCH PERSONS TOGETHER BEING REFERRED TO AS “RELEVANT PERSONS”). THE TERMS AND CONDITIONS SET OUT HEREIN MUST NOT BE ACTED ON OR RELIED ON BY PERSONS WHO ARE NOT RELEVANT PERSONS. ANY INVESTMENT OR INVESTMENT ACTIVITY TO WHICH THESE TERMS AND CONDITIONS SET OUT HEREIN RELATE IS AVAILABLE ONLY TO RELEVANT PERSONS AND WILL BE ENGAGED IN ONLY WITH RELEVANT PERSONS. THESE TERMS AND CONDITIONS DO NOT ITSELF CONSTITUTE AN OFFER FOR SALE OR SUBSCRIPTION OF ANY SECURITIES IN THE COMPANY. THE ANNOUNCEMENT IS NOT AN OFFER OF OR SOLICITATION TO PURCHASE OR SUBSCRIBE FOR SECURITIES IN THE UNITED STATES. THE SECURITIES REFERRED TO HEREIN HAVE NOT BEEN AND WILL NOT BE REGISTERED UNDER THE U.S. SECURITIES ACT OF 1933, AS AMENDED (THE “SECURITIES ACT”), AND MAY NOT BE OFFERED OR SOLD IN THE UNITED STATES, EXCEPT PURSUANT TO AN APPLICABLE EXEMPTION FROM, OR IN A TRANSACTION NOT SUBJECT TO, THE REGISTRATION REQUIREMENTS OF THE SECURITIES ACT. NO PUBLIC OFFERING OF SECURITIES IS BEING MADE IN THE UNITED STATES. NEITHER THE U.S. SECURITIES AND EXCHANGE COMMISSION NOR ANY SECURITIES REGULATORY AUTHORITY OF ANY STATE OR OTHER JURISDICTION OF THE UNITED STATES HAS APPROVED OR DISAPPROVED OF AN INVESTMENT IN THE SECURITIES OR PASSED UPON OR ENDORSED THE MERITS OF THE PLACING OR THE ACCURACY OR ADEQUACY OF THE CONTENTS OF THE ANNOUNCEMENT. ANY REPRESENTATION TO THE CONTRARY IS A CRIMINAL OFFENSE IN THE UNITED STATES. EACH PLACEE (BEING THE PERSON PROCURED BY WH IRELAND LIMITED (“WH IRELAND”)) TO SUBSCRIBE FOR PLACING SHARES SHOULD CONSULT WITH ITS OWN ADVISERS AS TO LEGAL, TAX, BUSINESS AND RELATED ASPECTS OF ANY INVESTMENT IN PLACING SHARES. 2. in the case of any Placing Shares acquired by it as a financial intermediary, as that term is used in Article 3(2) of the Prospectus Directive, (a) the Placing Shares acquired by it in the Placing have not been acquired on behalf of, nor have they been acquired with a view to their offer or resale to, persons in any Member State of the European Economic Area (the “EEA”) which has implemented the Prospectus Directive other than Qualified Investors or in circumstances in which the prior consent of WH Ireland has been given to the offer or resale; or (b) where Placing Shares have been acquired by it on behalf of persons in any member state of the EEA other than Qualified Investors, the offer of those Placing Shares to it is not treated under the Prospectus Directive as having been made to such persons. The Company and WH Ireland will rely upon the truth and accuracy of the foregoing representations, warranties, acknowledgements and undertakings. WH Ireland does not make any representation to any Placees regarding an investment in the Placing Shares referred to in the Announcement (including these Terms and Conditions). This Announcement does not constitute an offer, and may not be used in connection with an offer, to sell or issue or the solicitation of an offer to buy or subscribe for Placing Shares in any jurisdiction in which such offer or solicitation is or may be unauthorised or unlawful and any failure to comply with these restrictions may constitute a violation of applicable securities laws in such jurisdiction. This Announcement and the information contained herein is not for publication or distribution, directly or indirectly, to persons in any jurisdiction in which it is unlawful to do so (“Prohibited Jurisdiction”). Persons (including, without limitation, custodians, nominees and trustees) into whose possession the Announcement and these Terms and Conditions may come are required by the Company to inform themselves about and to observe any restrictions of transfer of the Announcement. No public offer of securities of the Company is being made in the United Kingdom, the United States or elsewhere. In particular, the Placing Shares referred to in the Announcement have not been and will not be registered under the Securities Act or any laws of or with any securities regulatory authority of any state or other jurisdiction of the United States, and may not be offered, sold, pledged or otherwise transferred within the United States except pursuant to an exemption from, or in a transaction not subject to, the registration requirements of the Securities Act and the securities laws of any state or other jurisdiction of the United States. No public offering of the Placing Shares or any other securities is being made in the United States. No money, securities or other consideration from any person inside the United States is being solicited pursuant to the Announcement or the Placing and, if sent in response to the information contained in the Announcement, will not be accepted. This Announcement is not an offer of securities for sale into the United States. The Placing Shares have not been approved or disapproved by the US Securities and Exchange Commission, any state securities commission or other regulatory authority in the United States, nor have any of the foregoing authorities passed upon or endorsed the merits of the Placing or the accuracy or adequacy of the Announcement. Any representation to the contrary is a criminal offence in the United States. The relevant clearances have not been, nor will they be, obtained from the securities commission of any province or territory of Canada; no prospectus has been lodged with or registered by the Australian Securities and Investments Commission or the Japanese Ministry of Finance; and the Placing Shares have not been nor will they be, registered under or offered in compliance with the securities laws of any state, province or territory of a Prohibited Jurisdiction. Accordingly, the Placing Shares may not (unless an exemption under the relevant securities laws is applicable) be offered, sold resold or delivered, directly or indirectly, in or into a Prohibited Jurisdiction. Solely for the purposes of the product governance requirements contained within: (a) EU Directive 2014/65/EU on markets in financial instruments, as amended (“MiFID II”); (b) Articles 9 and 10 of Commission Delegated Directive (EU) 2017/593 supplementing MiFID II; and (c) local implementing measures (together, the “MiFID II Product Governance Requirements”), and disclaiming all and any liability, whether arising in tort, contract or otherwise, which any “manufacturer” (for the purposes of the Product Governance Requirements) may otherwise have with respect thereto, the Placing Shares have been subject to a product approval process, which has determined that the Placing Shares are: (i) compatible with an end target market of (a) retail investors, (b) investors who meet the criteria of professional clients and (c) eligible counterparties (each as defined in MiFID II); and (ii) eligible for distribution through all distribution channels as are permitted by MiFID II (the “Target Market Assessment”). Notwithstanding the Target Market Assessment, distributors should note that: the price of the Placing Shares may decline and investors could lose all or part of their investment; the Placing Shares offer no guaranteed income and no capital protection; and an investment in the Placing Shares is compatible only with investors who do not need a guaranteed income or capital protection, who (either alone or in conjunction with an appropriate financial or other adviser) are capable of evaluating the merits and risks of such an investment and who have sufficient resources to be able to bear any losses that may result therefrom. 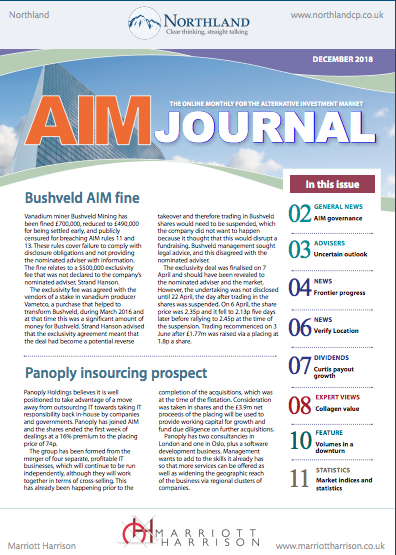 The Target Market Assessment is without prejudice to the requirements of any contractual, legal or regulatory selling restrictions in relation to the offer. Persons (including, without limitation, nominees and trustees) who have a contractual or other legal obligation to forward a copy of these Terms and Conditions or the Announcement of which it forms part should seek appropriate advice before taking any action. Terms defined elsewhere in the Announcement have the same meaning in these Terms and Conditions, unless the context requires otherwise. Various dates referred to in the Announcement are stated on the basis of the expected timetable for the Placing. It is possible that some of these dates may be changed. The expected date for Admission is on or around 08 April 2019 and, in any event, the latest date for Admission is 25 April 2019 (the “Long Stop Date”). WH Ireland has entered into a Placing Agreement with the Company under which WH Ireland has undertaken to use its reasonable endeavours to procure subscribers for the Placing Shares at the Placing Price, being 0.15 pence per Placing Share, on the terms and subject to the conditions set out in these Terms and Conditions. To the extent WH Ireland does not procure subscribers for Placing Shares as required, including those Placees procured by the Company, WH Ireland will not itself subscribe for such shares. These Terms and Conditions give details of the terms and conditions of, and the mechanics of the participation of the Placees in, the Placing. The Placing Shares will, when issued, be credited as fully paid and will rank pari passu in all respects with the existing Ordinary Shares in issue (“Existing Ordinary Shares”), including the right to receive all dividends and other distributions (if any) declared, made or paid on or in respect of the Existing Ordinary Shares after the date of issue of the Placing Shares. WH Ireland and the Company reserve the right to scale back the number of Placing Shares to be allotted to any Placee in the event of an oversubscription under the Placing. WH Ireland and the Company also reserve the right not to accept offers for Placing Shares or to accept such offers in part rather than in whole. Each Placee will be required to pay to WH Ireland, on the Company’s behalf, an amount equal to the product of the Placing Price and the number of Placing Shares that such Placee is required to be allotted in accordance with the terms set out in or referred to in these Terms and Conditions. Each Placee’s obligation to be allotted and pay for Placing Shares under the Placing will be owed to each of the Company and WH Ireland. Each Placee will be deemed to have read these Terms and Conditions in their entirety. Neither WH Ireland nor or any shareholder, director, officer, employee or agent of WH Ireland or any of their group companies will have any liability (subject to applicable legislation and regulations) to Placees or to any person other than the Company in respect of the Placing. Application will be made to the LSE for the Placing Shares to be admitted to trading on AIM and on the NEX. It is expected that Admission will take place at 8.00 am on or around 08 April 2019 (or such later date as may be agreed between the Company and WH Ireland, provided that such date is no later than 25 April 2019 (the “Long Stop Date”). Participation in the Placing is only available to persons who may lawfully be, and are, invited to participate in it by WH Ireland. 1. WH Ireland is arranging the Placing as sole placing agent and broker of the Company. 2. Participation in the Placing will only be available to persons who may lawfully be, and are, invited to participate by WH Ireland. WH Ireland and its respective affiliates are entitled to acquire Placing Shares as principal. 3. The Company reserves the right to reduce or seek to increase the amount to be raised pursuant to the Placing, in its absolute discretion. The final allocations of the Placing Shares (including as to the identity of the Placees and the number of shares allocated to each Placee at the Placing Price) shall be determined by WH Ireland in their absolute discretion. 4. Each Placee’s allocation will be confirmed to Placees orally, or by email, by WH Irelandand a trade confirmation or contract note will be dispatched as soon as possible thereafter (the “Contract Note”). These Terms and Conditions will be deemed to be incorporated into the Contract Note. WH Ireland‘s oral or emailed confirmation to such Placee will constitute an irrevocable and legally binding commitment upon such person (who will at that point become a Placee) in favour of WH Ireland and the Company, under which it agrees to subscribe for the number of Placing Shares allocated to it at the Placing Price on the terms and conditions set out in these Terms and Conditions (which are deemed to be incorporated in such trade confirmation or contract note) and in accordance with the Company’s articles of association (“Articles of Association”). 5. Any acquisition of Placing Shares will be made on the terms and subject to the conditions in these Terms and Conditions and will be legally binding on the Placee on behalf of which it is made and, except with WH Ireland‘s consent, will not be capable of variation or revocation after the time at which it is submitted. Each Placee will also have an immediate, separate, irrevocable and binding obligation, to pay WH Ireland (or as WH Ireland may direct) in cleared funds an amount equal to the product of the Placing Price and the number of Placing Shares for which such Placee has agreed to subscribe. Each Placee’s obligations will be owed to WH Ireland. 10. Irrespective of the time at which a Placee’s allocation pursuant to the Placing is confirmed, settlement for all Placing Shares to be acquired pursuant to the Placing will be required to be made at the same time, on the basis explained below under “Settlement”. 11. All obligations under the Placing will be subject to fulfilment of the conditions referred to below under “Conditions to the Placing” and to the Placing not being terminated on the basis referred to below under “Conditions to the Placing”. 12. By participating in the Placing, each Placee agrees that its rights and obligations in respect of the Placing will terminate only in the circumstances described below and will not be capable of rescission or termination by the Placee. 13. To the fullest extent permissible by law and the applicable rules of AIM, neither WH Ireland not any of its respective affiliates shall have any liability to Placees (or to any other person whether acting on behalf of a Placee or otherwise whether or not a recipient of these terms and conditions) in respect of the Placing. Each Placee acknowledges and agrees that the Company is responsible for the allotment of the Placing Shares to the Placees and WH Ireland shall not have any liability to the Placees for the failure of the Company to fulfil those obligations. In particular, neither WH Ireland nor any of its affiliates shall have any liability (including to the extent permissible by law, any fiduciary duties) in respect of the Placing. 14. In making an investment decision, Placees must rely on their own examination of the Company and its prospects and the terms of the Placing, including the merit and risks involved in investing in the Placing Shares. 15. Settlement will occur on a date to be advised but is expected to be on or around 08 April 2019 (“Closing Date”). All such times and dates will be subject to amendment at WH Ireland’s discretion, except that in no circumstances will the date scheduled for Admission be later than the Long Stop Date. The Placing Shares are being offered to a limited number of specifically invited persons only and will not be offered in such a way as to require a prospectus in the United Kingdom or in any other jurisdiction. No offering document or prospectus has been or will be submitted to be approved by the Financial Conduct Authority, the LSE, NEXE or any other regulatory body in relation to the Placing and Placees’ commitments in respect of Placing Shares will be made solely on the basis of the information contained in the Announcement and the terms and conditions contained in these Terms and Conditions. Settlement of transactions in the Placing Shares will take place inside the CREST system. Settlement of transactions in the Placing Shares will, unless otherwise agreed, take place on a delivery versus payment basis within the CREST system administered by Euroclear UK and Ireland Limited (“CREST”). The Company will procure the delivery of the Placing Shares to CREST accounts operated by WH Ireland for the Company and WH Ireland will enter its delivery (DEL) instructions into the CREST system. The input to CREST by each Placee of a matching or acceptance instruction will then allow delivery of the relevant Placing Shares to that Placee against payment. The Company reserves the right to require settlement for and delivery of the Placing Shares (or a portion thereof) to any Placee in any form it requires if, in WH Ireland’s opinion, delivery or settlement is not possible or practicable within CREST or would not be consistent with the regulatory requirements in the Placee’s jurisdiction. Following the close of the Placing, each Placee allocated Placing Shares in the Placing will be sent a trade confirmation or contract note stating the number of Placing Shares, the Placing Price and the subscription amount payable to be allocated to it and will be required to provide WH Ireland with funds sufficient to purchase such securities prior to the Closing Date. It is expected that settlement will take place on or about 08 April 2019 in CREST on a T+10 basis in accordance with the instructions set out in the trade confirmation. Settlement will be through WH Ireland against CREST ID: 601 A/C: WRCLT. Following the close of the Placing, each Placee allocated Placing Shares in the Placing will be sent a trade confirmation(s) stating the number of Placing Shares to be allocated to it at the Placing Price and settlement instructions. Each Placee agrees that it will do all things necessary to ensure that delivery and payment is completed in accordance with the applicable registration and settlement procedures, including if applicable, CREST rules and regulations and settlement instructions that it has in place with WH Ireland. If the Placing Shares are to be delivered to a custodian or settlement agent, Placees should ensure that the trade confirmation is copied and delivered immediately to the relevant person within that organisation. No UK stamp duty or stamp duty reserve tax should be payable to the extent that the Placing Shares are issued into CREST to, or to the nominee of, a Placee who holds those shares beneficially (and not as agent or nominee for any other person) within the CREST system and registered in the name of such Placee or such Placee’s nominee provided that the Placing Shares are not issued to a person whose business is or includes issuing depositary receipts or the provision of clearance services or to an agent or nominee for any such person. The agreement to settle a Placee’s subscription (and/or the subscription of a person for whom such Placee is contracting as agent) free of stamp duty and stamp duty reserve tax depends on the settlement relating only to a subscription by it and/or such person direct from the Company for the Placing Shares in question. Such agreement assumes that the Placing Shares are not being subscribed for in connection with arrangements to issue depositary receipts or to transfer the Placing Shares into a clearance service. If there are any such arrangements, or the settlement relates to any other subsequent dealing in the Placing Shares, UK stamp duty or stamp duty reserve tax may be payable, for which neither the Company nor WH Ireland will be responsible, and the Placee to whom (or on behalf of whom, or in respect of the person for whom it is participating in the Placing as an agent or nominee) the allocation, allotment, issue or delivery of Placing Shares has given rise to such UK stamp duty or stamp duty reserve tax undertakes to pay such UK stamp duty or stamp duty reserve tax forthwith and to indemnify on an after-tax basis and to hold harmless the Company and WH Ireland in the event that the Company or WH Ireland has incurred any such liability to UK stamp duty or stamp duty reserve tax. If this is the case, each Placee should seek its own advice and notify WH Ireland accordingly. 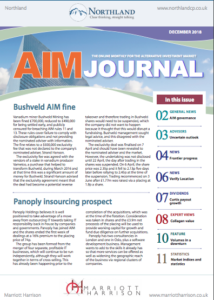 In addition, Placees should note that they will be liable for any stamp duty and all other stamp, issue, securities, transfer, registration, documentary or other duties or taxes (including any interest, fines or penalties relating thereto) payable outside the UK by them or any other person on the subscription by them of any Placing Shares or the agreement by them to subscribe for any Placing Shares. WH Ireland has entered into the Placing Agreement with the Company under which WH Ireland has agreed on a conditional basis to use its reasonable endeavours as agent of the Company to procure Placees at the Placing Price for the Placing Shares. WH Ireland is granted standard placing commissions and broker warrant over ordinary shares. 4. the Placing Agreement becoming unconditional in all other respects. the Placing in relation to the Placing Shares will lapse and the Placee’s rights and obligations hereunder in relation to the Placing Shares shall cease and terminate at such time and each Placee agrees that no claim can be made by the Placee in respect thereof. WH Ireland may, in its absolute discretion, upon such terms as it thinks fit, waive compliance by the Company with certain of the Company’s obligations in relation to the conditions in the Placing Agreement save that the certain conditions including the condition relating to Admission taking place may not be waived. Any such extension or waiver will not affect the Placees’ commitments as set out in the Announcement. WH Ireland reserves the right to waive or extend the time and or date for the fulfilment of any of the conditions in the Placing Agreement to a time no later than 8.00 a.m. on the Long Stop Date. If any condition in the Placing Agreement is not fulfilled or waived by WH Ireland by the relevant time, the Placing will lapse and each Placee’s rights and obligations in respect of the Placing will cease and terminate at such time. Neither the Company nor WH Ireland shall have any liability to any Placee (or to any other person whether acting on behalf of a Placee or otherwise) in respect of any decision it may make as to whether or not to waive or to extend the time and /or date for the satisfaction of any condition to the Placing nor for any decision they may make as to the satisfaction of any condition or in respect of the Placing generally and by participating in the Placing each Placee agrees that any such decision is within the absolute discretion of the Company and WH Ireland. The Placing Agreement may be terminated by WH Ireland at any time prior to Admission in certain circumstances including, among other things, following the Company failing to comply with its obligations under the Placing Agreement or the occurrence of certain force majeure events. The exercise of any right of termination pursuant to the Placing Agreement, any waiver of any condition in the Placing Agreement and any decision by WH Ireland whether or not to extend the time for satisfaction of any condition in the Placing Agreement will be within the absolute discretion of WH Ireland. Following Admission, the Placing Agreement is not capable of rescission or termination in respect of the Placing. The rights and obligations of the Placees shall terminate only in the circumstances described in these terms and conditions and will not be subject to termination by the Placee or any prospective Placee at any time or in any circumstances. By participating in the Placing, Placees agree that the exercise by WH Ireland of any right of termination or other discretion under the Placing Agreement shall be within the absolute discretion of WH Ireland, and that WH Ireland need not make any reference to Placees and that it shall have no liability to Placees whatsoever in connection with any such exercise. The offering of Placing Shares and the agreement arising from acceptance of the Placing is personal to each Placee and does not constitute an offering to any other person or to the public. A Placee may not assign, transfer, or in any other manner, deal with its rights or obligations under the agreement arising from the acceptance of the Placing, without the prior written agreement of WH Ireland in accordance with all relevant legal requirements. A Placee’s entitlement to receive any Placing Shares under the Placing will be conditional on WH Ireland‘s receipt of payment in full for such Placing Shares by the relevant time to be stated in the written confirmation referred to above, or by such later time and date as WH Ireland and the Company may in their absolute discretion determine, and otherwise in accordance with that confirmation’s terms. (4) such Placee will remain liable to the Company and to WH Ireland for the full amount of any losses and of any costs which either of them may suffer or incur as a result of it (i) not receiving payment in full for such Placing Shares by the required time, and/or (ii) the sale of any such Placing Shares to any other person at whatever price and on whatever terms as are actually obtained for such sale by or for it. Interest may be charged in respect of payments not received by WH Ireland for value by the required time referred to above at the rate of two percentage points above the base rate of Barclays Bank plc. (ww) the Placee agrees that the Company and WH Ireland will rely upon the truth and accuracy of the foregoing conformations, representations, warranties, acknowledgements undertakings and agreements which are given by each Placee (or persons acting on their behalf) to WH Ireland and the Company and are irrevocable. The terms set out in the Announcement (including these Terms and Conditions) and the allocation of Placing Shares (including the subscription amount payable) as confirmed to a Placee, constitute the entire agreement to the terms of the Placing and a Placee’s participation in the Placing to the exclusion of prior representations, understandings and agreements between them. Any variation of such terms must be in writing. The agreement arising out of acceptance of the Placing and any dispute or claim arising out of or in connection with the Placing or formation thereof (including non-contractual disputes or claims) shall be governed by and construed in accordance with the laws of England. Each Placee irrevocably agrees to submit to the exclusive jurisdiction of the courts of England to settle any claim or dispute that arises out of or in connection with the agreement arising out of acceptance of the Placing or its subject matter or formation (including non-contractual disputes or claims).